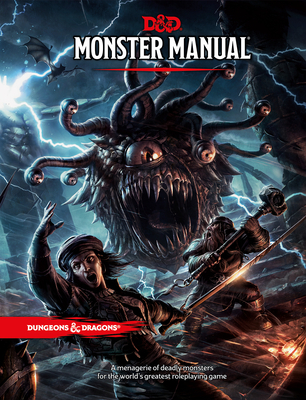 The Monster Manual teaches you how to how to fill your Dungeons & Dragons games with monsters—how to populate the game with pesky goblins and mighty dragons for players to battle or beguile, outwit or outrun. Inside the Monster Manual you’ll find more than 150 classic D&D creatures, with vivid illustrations and rich descriptions to help breathe life into your zombies and liches. • The Monster Manual is one of the three main Dungeons & Dragons books, along with the Player’s Handbook and the Dungeon Master’s Guide. It’s an essential resource for Dungeon Masters to use in populating any type of challenge they might contrive for their players. • From an angel’s wingspan to the vacant eyes of a zombie beholder, the Monster Manual includes more than 150 creatures illustrated in vivid color, with more than 400 quick reference tables to help you bring them to life with ease. • Rich descriptions of each monster help trigger your imagination. From the familiar (“vampires hate sunlight”) to the arcane (“what color is the vapor from a gorgon’s nose?”), the Monster Manual helps inspire your decisions and keep the game flowing smoothly.